Demega formulations India is involved in offering excellent quality medicines to our most valued clients. Acute or Chronic kidney disease has many causes and some types of kidney disease can be treated and cured,Treatments to preserve kidney function can include dietary interventions, diabetes management, weight management and medications to treat high blood pressure, anemia, bone disease, and hormone deficiencies associated with kidney disease. 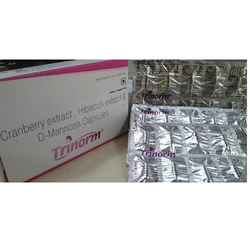 herbo-mineral urinary antiseptic extract marketed internationaly by brand names "cranberry,cranaxil,cymalon"
Demega formulations India is a prime exporter for Sirolimus is a potent non-calcineurin inhibiting immuno suppressant used after renal transplantation as it prevents impaired kidney function or even chronic renal failure. 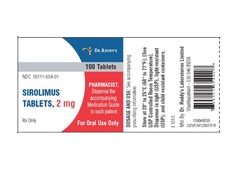 Sirolimus has been shown to be usefull in cancer as it has antineoplastic properties. we assure quality of products,products of long expiration date and ship in discreet packings. Demega formulations India is a prime exporter for SUCROFER (Iron sucrose) Injectable is widely used in treatment of the iron deficiency and iron deficiency anemia and patients undergoing chronic Hemodialysis receiving supplemental erythropoietin therapy. we assure quality of injections,injections of long expiration date and ship in discreet packing. Dose Adult:100 mg 3 times/day. Demega formulations India is major exporter of "comfora(sodium pentosan polysulfate)"used for interstitial cystitis/painful bladder syndrome,patients of frequency of urine,urgency, pressure and/or pain. 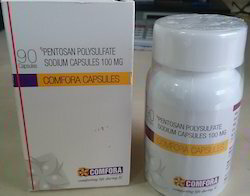 "comfora(sodium pentosan polysulfate)"is also suitable for painful ,pain and/or discomfort while sitting/driving car. 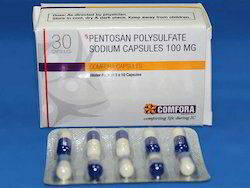 "comfora(sodium pentosan polysulfate)" is available as pills or as a direct infusion into the bladder. 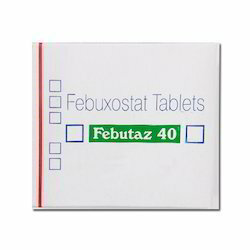 Febutaz is indicated for the chronic management of hyperuricemia in subjects with gout. Dosage and Administration: For the chronic management of hyperuricemia in subjects with gout, Febutaz is suggested at 40 mg to 80 mg every day. The suggested initial dosage of Febutaz is 40 mg ever day. For subjects who do not attain a serum uric acid lesser than 6 mg/ dl even following two weeks with Febutaz 40 mg, 80 mg dose is suggested. Febutaz is indicated for the chronic management of hyperuricemia in subjects with gout. Demega formulations India is major exporter of Calcium Acetate Tablets used in hyperphosphatemia in kidney failure patients since it controls increased phosphate level ,delays progression of CRF "Calcium Acetate " marketed in the USA by name "Paddock",in UK by brand name "Roxane". Demega formulations India is a prime exporter for Essential Amino Acids Tablet contains eight essential amino acids and two non essential amino acids, Histidine & Tyresine.Slows down CRF progression rate,Reduces unnecessary load of nitrogen and inorganic irons,Promotes muscle protein synthesis,Due to protein restrictions there may be chances of deficiency of amino acids in kidney failure patients. 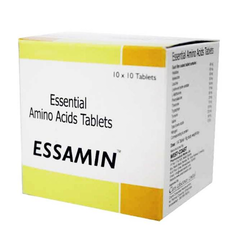 ESSAMIN normalizes plasma amino acid concentration, increases protein synthesis in body, and reduces the progression of CRF. Indications:-Nutrition supplement for malnourished patient. Leading Dropshipping & Exporter of Febuxostat Tablets. Backed by the support of our experienced professionals in this domain, we have been able to bring forward a qualitative grade of Febuxostat Tablets with various brand. The provided tablet is well formulated by our renowned professionals using the best quality natural ingredients and modern technology. Offered tablet is highly acknowledged by our clients owing to its effective and quick results. Our clients can avail this tablet at most affordable price. Dose Adult : Instill 1 drop once nightly. 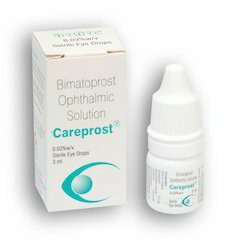 Careprost (bimatoprost ophthalmic solution) is a Eye lash growth promoter. KETOLOG (Alpha ketoanalogue) a medication for the treatment of chronic kidney disease patients . KETOLOG (Alpha ketoanalogue)in combination with very low protein diet , helps in delaying the progression of kidney disease in the Pre-dialysis period. We assure quality of products,products long expiration date and ship in discreet packings. Demega formulations India is a prime exporter for SILODAL(Silodosin) for the symptomatic treatment of benign prostatic hyperplasia(B.P.H) and is used to improve urination in men with benign prostatic hyperplasia (increase prostate). SILODAL(Silodosin) works by relaxing muscles in the prostate and bladder. 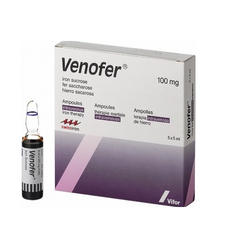 Monitor kidney, liver function regularly while taking this medication. Silodosin is marketed in the USA by brand name"Rapaflo (USA), Silodyx (Europe and South Africa), Rapilif (India), Urief (Japan), Urorec (Russia)) ". we assure medicines of quality,medicines of long expiration date and ship in discreet packings. Demega formulations India is major exporter of Fluoxetine Capsule is an antidepressant, prescribed for depression and anxiety. 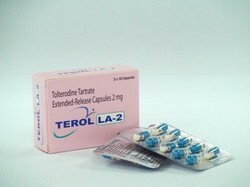 Fluoxetine Capsule is also used for obesity and eating disorders. 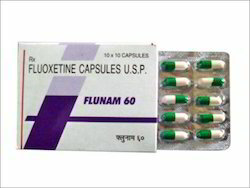 Fluoxetine Capsule is known by brand name PROZAC in USA/ UK. We assure quality of medicines,ship long expiration date medicines in discreet packings. Backed by the support of our experienced professionals in this domain, we have been able to bring forward a qualitative grade of Febuxostat Tablets with various brand. The provided tabley is well formulated by our renowned professionals using the best quality natural ingredients and modern technology. Offered tablet is highly acknowledged by our clients owing to its effective and quick results. Our clients can avail this tablet at most affordable price. Demega formulations India is a prime exporter for KAPSTAT(Calcium polystyrene sulphonate) indicated in hyperkalemia associated with anuria and oliguria,burns,trauma,infections. 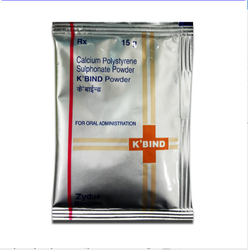 KAPSTAT(Calcium polystyrene sulphonate) acts by removing potassium ions from the large intestine lumen . Calcium polystyrene sulphonate marketed in USA/EUROPE by brand names"Calcium Resonium, Sorbisterit, Resikali, "
Demega formulations India is a prime exporter for "URIVOID(Bethanechol chloride)" indicated for the acute postoperative and postpartum non obstructive (functional) urinary retention and for neurogenic atony of the urinary bladder with retention. 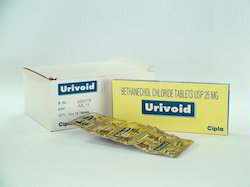 Bethanechol chloride is marketed in USA ,EUROPE by brand name"Duvoid , Myotonachol , Urecholine and Urocarb . " Demega formulations India is a major exporter of "Comfora (Pentosan Polysulfate Sodium)" Capsules for InterstitialCystitis(painful bladder syndrome) provides relief from pain and discomfortand urgency in urination. 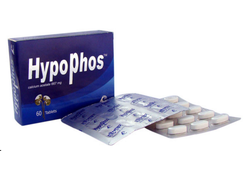 we assure quality of medicine,medicine of long expiration date and ship in discreet packing. Demega formulations India is a prime exporter of combination pill "Urimax F ( Tamsulosin + finasteride)" prescribed for the treatment of overactive bladder with symptoms of urinary incontinence.for relief of symptoms of benign enlargement of prostate. 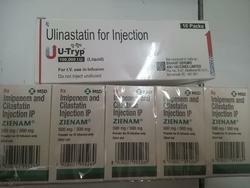 Demega formulation India is major exporter of U-Tryp (Ulinastatin), or urinary trypsin inhibitor (UTI) is a glycoprotein that acts as a trypsin inhibitor. It can be derived from urine or synthetically produced. Looking for Nephrology Medicine ?